Ali Nyang (blue) in action. 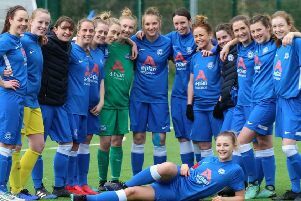 The Peterborough League club at the centre of a racism storm on Saturday (March 16) have denied accusations their spectators made monkey noises at an opposition player. The Division Two game between Huntingdon-based Eunice FC and Stilton United was abandoned after 40 minutes following allegations of racist abuse aimed at Stilton player Ali Nyang by Eunice supporters. Referee Paul Gale, who didn’t hear any offensive words, called a halt to the game as the allegations made by Stilton players led to confrontations with their opponents. 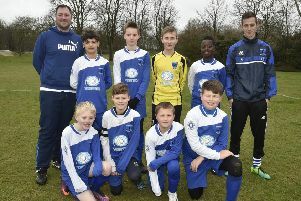 Euince FC received a battering on social media after the Peterborough Telegraph published the story yesterday, but the club have hit back this morning. In a statement to the Peterborough Telegraph a Eunice official denied Stilton’s claims of racist behaviour and blamed the abandonment on their opponents. The statement read: “In connection with apearing in the local press re accusations of racist behavioor of some spectators at Saturday’s match between Eunice, Huntingdon and Stilton, the club feels obligated to respond. “The club categorically condemns any behaviour that strikes any nationality, colour or religion, but denies that such events took place during our last match. The match was interrupted after a clear intervention made by a coach of the visiting team who insisted on players leaving the pitch. It is worth adding that he was on the opposite side of the pitch to the spectators and the referee clearly indicated that no offensive gestures came to him. “Club Eunice want to point out that the match was properly secured in accordance with the League regulations and is ready to fully co-operate with the FA in order to clarify the incident.